The extra benefits keep on coming with Works Deluxe. It starts with two priority checked bags (up to 23kg each), premium check-in and priority boarding. Once on board you'll be super comfortable in your self-selected seat, which will have a guaranteed empty seat next to you. Then you can enjoy a full meal, free-of-charge drinks and unlimited access to our gate-to-gate inflight entertainment options. 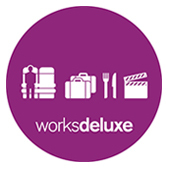 Works Deluxe fare is only available on Air New Zealand operated flights. Find out more about eating and drinking on flights to New Zealand, Australia and the Islands.